Buy IDEAL 5009-3CC / 6 x 50 mm Cross Cut Shredder in Sharjah, Dubai, Abu Dhabi UAE. Application - High Capacity Shredder, Feed opening - 500 mm, Shredding Size - 6 x 50 mm cross-cut, Levels of Security (DIN #66399) - P-3, Sheet capacity (70gsm | 80gsm) - 300-400|250-350. 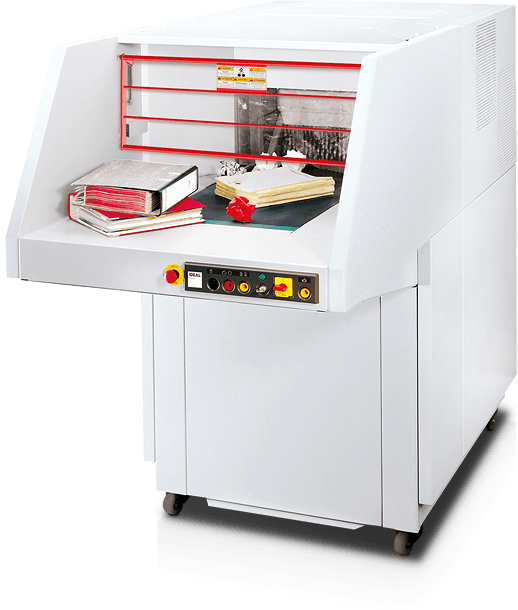 Complete lever arch files including metal components can be shredded due to the high-quality, tempered steel cutters. The door on the rear side of the shredder is electronically secured and allows safe and easy removal of the shred trolley. By using the conveyor belt system the output of the shredder can be doubled (removing of the full plastic bag is not necessary). A centralised oiler for easy lubrication of the cutting head is standard equipment on this high-capacity shredder.